Facebook users upload and share lot of photos with online friends. 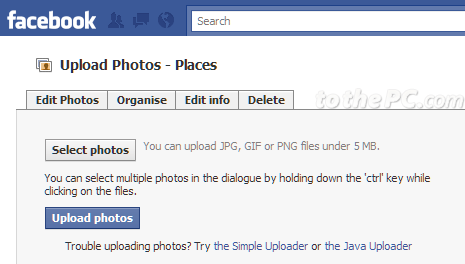 Infact, Facebook now has more uploaded photos than dedicated photo sharing websites like Flickr, Photobucket. Facebook users can upload photos and arrange them properly in different albums. You can also tag uploaded photos for easy identification and better management. So, is there any limit on number of photos that I can upload on Facebook? Fortunately, there is NO LIMIT on number of photos a Facebook user can upload. You can upload any number of photos from your computer or mobile to Facebook account. However, there are restriction on number of photos that can be uploaded in specific albums. An individual photo album can only hold specific number of photos. You can only upload 200 photos per album. You need to create a fresh album to upload more photos. There is no limit on number of photo albums that you can create. Unlike regular photo albums, you can only upload upto 100 photos in ‘mobile uploads’ album. A new ‘mobile uploads’ album is automatically create when you attempt to upload more than 100 photos. While there are limits on number of photo uploads per albums, practically you can upload as many photos spread across multiple photo albums. So, upload photos without worrying about limits – thats Facebook for you! just wondering if you can make a secret address to get onto facebook so that we can get on it school computers. because its always blocked!